Low-e window films will improve the emissivity of a glass. A window unit that is treated with a Low-e window film will reflect radiant heat back into the room; in colder temperatures when the heat is running in your building or office space this can translate into lower energy cost. 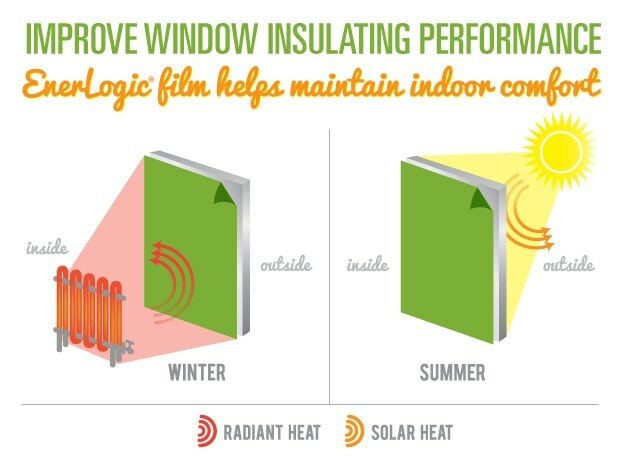 EnerLogic® is a low-e window film that reduces solar heat gain and radiant heat loss, creating year-round heating and cooling savings of up to three times as much as conventional window film with comparable light transmission. How is this possible? That's where EnerLogic® comes in. EnerLogic commercial window film’s low-e coating was developed to offer all the benefits of year-round energy savings while also minimizing iridescent shine. The result is a more aesthetically pleasing, ultra-efficient low-e commercial window film. Why should I choose EnerLogic instead of new low-e windows or another low-e window film? Low-e stands for “low emissivity.” Emissivity is a measure of a surface’s ability to absorb or reflect far-infrared radiation. The lower the emissivity, the lower the far-infrared absorption and the higher the far-infrared reflection. The sun’s rays, contain ultraviolet, visible, and near infrared radiation. Low-e windows provide minimal protection against incoming radiation from the sun, but do reflect longer far infrared wave lengths. Far-infrared radiation is re-radiated from objects (both inside and outside the building) that have been heated by the original radiation from the sun or heated in other ways. The body senses all infrared radiation as heat. This video outlines the the detailed energy savings measurement and analysis performed during an EnerLogic low-e window film installation project at the Hyatt Regency Hotel in downtown Houston, TX. Free estimate and product demonstration available upon request.